Cuzco, the ancient capital of the Incan empire in what is now Peru, was fortified by the massive structure of Sacsahuaman on a hill above the city. This walled citadel resides on top of a cone-shaped hill 12,000 feet above sea level. Its vast residential palaces, storehouses, inner forts, paved courtyards, and 50,000-gallon reservoir present a persistent puzzle to architects and engineers. 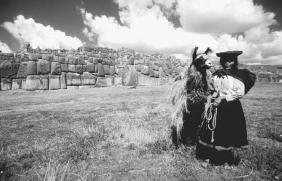 Although the Incas are given credit for having built Sacsahuaman from 1438 to 1500, guidebooks state that the "basic structure" may have been lying in ruins, awaiting new inhabitants, when the Incas claimed the fortress. Some of the boulders that are part of the fortress have been estimated at more than 20 tons, and the largest is 12 feet thick and 25 feet tall. The quarries that yielded the stone for Sacsahuaman are located about 20 miles from the city. It still puzzles researchers as to how the Incas moved the massive boulders across rivers, down deep ravines, then up to the mountaintop site of Sacsahuaman. Some archaeologists have stated that the Incas were skilled stonecutters. In Sacsahuaman, the massive stones fit together so precisely that a mechanic's thickness gauge cannot be inserted between the rocks in the walls. Some archaeologists have argued that stones can be worked to fit closely together; that is, stones roughly cut can be shaped to fit by being rubbed together. Deuel, Leo. Conquistadors Without Swords. New York: St. Martin's Press, 1967.